One of my many fond memories of hot summer days and nights in Iran is when my grandmother used to make Sharbateh Sekanjebin. I also remember this refreshing drink being offered to guests when they visited. Since summer is right around the corner, I thought this is the best time to post about this refreshing drink! 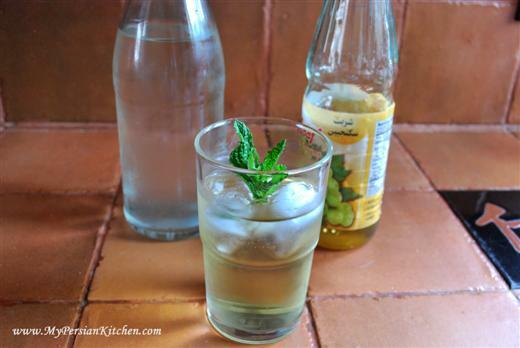 Sekanjebin is a mint syrup and it is a mixed with water and severed on ice. All you need for this delicious drink is Sekanjebin, water, ice, and a mint spring for decoration. Mix one part sekanjebin with 2 parts water. Mix well until the syrup is diluted. If you prefer your drink on the sweeter side then add more syrup, but if you prefer it less sweet then add less syrup. 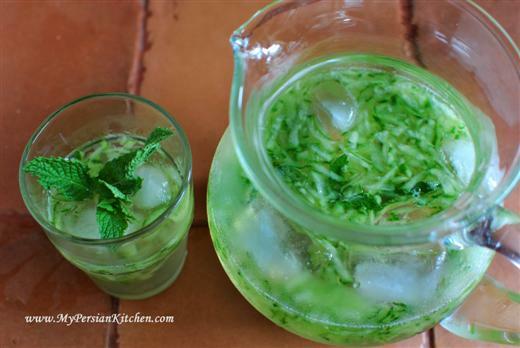 A great addition to this refreshing drink is grated cucumber. It makes the whole thing even better!! I usually calculate one cucumber for every two drinks. In a pitcher add one part sekanjebin, 2 parts water and a few ice cubes. 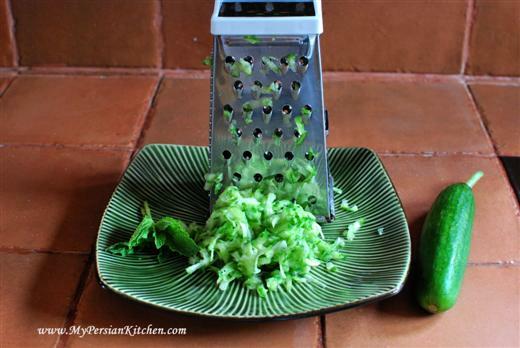 Add grated cucumbers. And mix well. 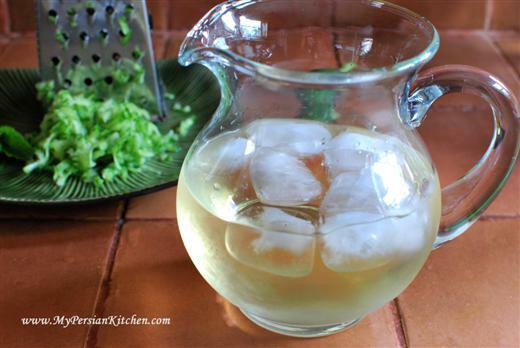 So simple, delicious, AND super refreshing!!! Oh my goodness, this drink just sounds incredibly refreshing. I need to try it soon. I can sense I new must have when I see one. Could you make your own sekanjebin, I’m guessing its simple syrup steeped with mint? OysterCulture, it is incredibly refreshing indeed! You can make your own Sekanjebin and from what I have been told there is an addition of vinegar to the mix too. I will be posting the recipe for it when I get it from the person who promised me hers!! This was one of the first Persian things I learned to make for my husband. I remember thinking…Geez, I wish we had this in America…it is so delicious. Now I’m thirsty Is the simple syrup with the addition of orange blossom water the same thing? Suzie, no, sekanjebin is made with water, vinegar and sugar so it has a sweet minty taste. craving some now, especially on this hot day! I think my mom has a stash…going to get some of hers!! This looks amazing. I can’t remember ever having had this as a kiddo. Gotta make up for lost time this summer and enjoy it. 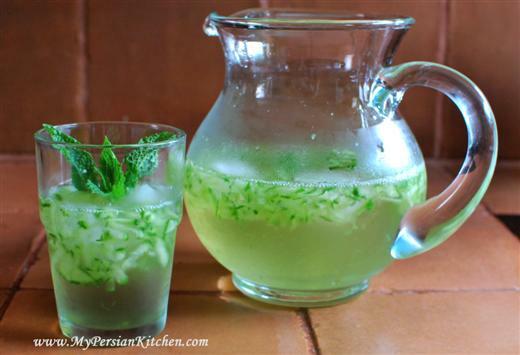 I am a big Persianophile ( I don’t know if the word exists) and I love this drink and everything else you post! tasteofbeirut, thank you for your kind words. I am a huge fan of Lebanese food myself and salivate at all the delicious recipes you post! My daughter-in-law is from Iran. I thought I might surprise her with something from ‘home’. I made the syrup (from the recipe another reader submitted), grated the cucumber and what I’m not quite certain of is whether the cucumber winds up in the glass along with the ice cubes or remains in the pitcher. I put it in the glass with the ice cubes and it sank to the bottom and clung to the cubes. Is that how it works? Her Mom lives with them and cooks all the time, but I thought a gift of homemade syrup might please them since I’ve got a lot of fresh mint growing all over my yard. From reading your blog, I’ve finally found out how to make some of my favorites from her cooking and the restaurants they take me to. I’ve tried cooking with them several times, but you know how it is, a little of this, a pinch of that, and me running around after her with paper, pencil and a measuring cup! This blog is awesome! Annette, thank you for your kind words. I am happy now you have a resource for Persian food. When serving the drink with cucumbers everything goes in the glass. Make everything in a pitcher then pour in glasses allowing for an even amount of cucumbers in each glass. You might want to use a spoon for help. My family loves this drink!!! 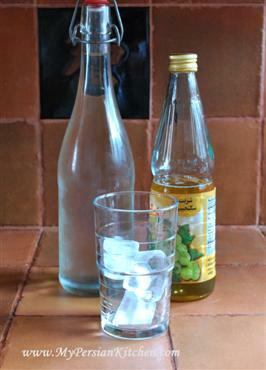 It was the perfect drink for surviving our recent heat wave!!! My kids want to sell Mint Drinks instead of lemonade this summer. Cameron, that’s such an awesome idea!!! I just remember that i have not drunk that for the last 30 years.